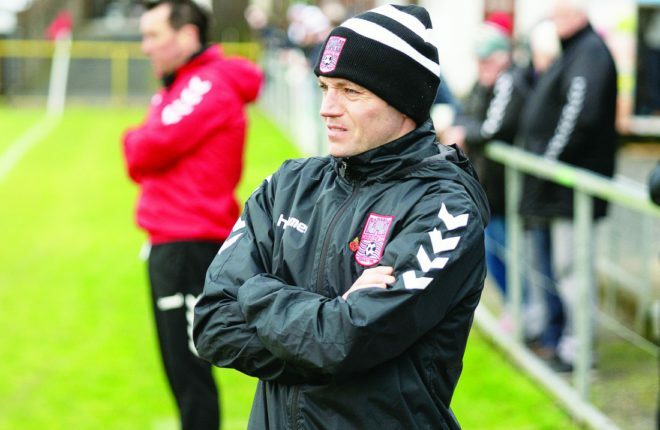 Omagh Accies will be without Stuart Ballantine tomorrow. OMAGH Accies head coach Phil Marshall experienced unusual emotions at the end of his side’s 10-19 win at City of Derry on Saturday – he was leaving disappointed after an away victory. Prior to kick-off at Craig Thompson Stadium, Marshall would have gladly accepted the end result, but after watching his side dominate large spells of the derby clash and miss out on what should have been a try-scoring bonus point win, he’s demanding nothing less than victory at home against Tullamore tomorrow. “There’s no point in hiding it, a win is the absolute minimum we’re demanding,” he confirmed. “If we can get four tries during that win, then brilliant, that’s the optimum. “Are we capable of doing that? I have no doubt about that. The Accies showed flashes of their capability against Derry on Saturday, inflicting a first home defeat of the season on Paul O’Kane’s side in the process. However, as has been the case throughout this season, missed chances ultimately proved costly. “There’s absolutely no doubt about it, we butchered a chance for a winning bonus point and that’s the one disappointment,” Marshall observed. “To be nil-nil at half-time was a travesty! How we didn’t score at least two tries in the first half I’ll never know! “We completely controlled the game from start to finish and that’s what we talked about at half-time – that wee bit of accuracy and that wee bit more organisation. “We got it mostly in the second half – there were a couple of wee things I wasn’t happy about – there was a bit of white line fever and things like that. Overall, Marshall was pleased with the result and performance against Derry but he is hoping for an even better outing tomorrow against Tullamore at the Thomas Mellon Playing Fields, which will be their last Ulster Bank League clash for a fortnight. “We’re just not on the money yet – we’re close, very close – and some week we really will click and I’m really looking forward to Tullamore at home,” he acknowledged. Ahead of tomorrow’s clash, Marshall confirmed that alongside long-term absentee, Ali Beckett, consistent outhalf Stuart Ballantine has been ruled out due to concussion, but the impressive Matthew Eccles, whose foot injury sustained against Derry wasn’t as bad as feared, will hopefully be fit to play. Apart from that trio, he enjoys the luxury of a clean bill of health.